Over 8,000 years ago humans first domesticated Aurochs, the wild ancestor of the numerous breeds of cattle that have played such an important role in human development. In the thousands of years after this first momentous event, humans have bred herds of domesticated animals for use as transportation, companions, protection, clothing and food. In these domesticated groups individual animals exhibiting certain characteristics were selected by the herdmaster and bred to each other. The resulting generations ultimately created the hundreds of breeds of cattle presently known to man. The Aurochs themselves became extinct prior to 1627, but their legacy lives on. 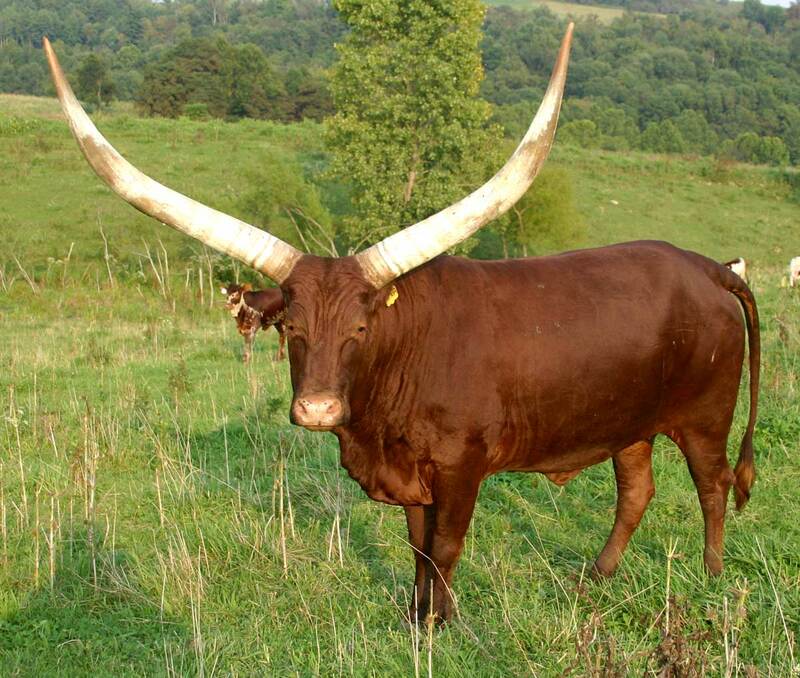 For some 6000 years a group of very similar cattle with huge horns have played a role in the lives of African tribes. 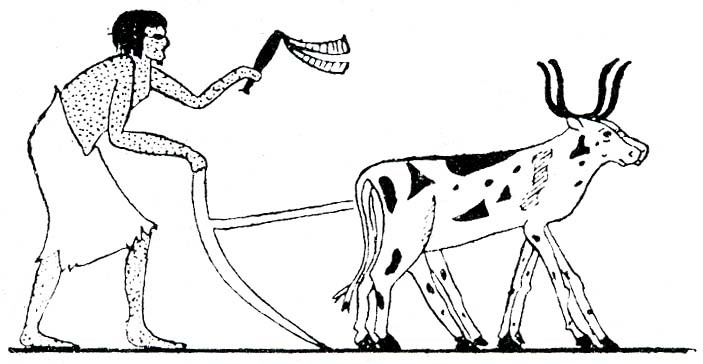 Various breeds of cattle were mixed through generations as humans moved across the African continent until the distinctive Sanga type was produced. Sanga cattle are the background type for many of the individual breeds now available. One of the oldest and definitely most exciting breeds of these cattle is most commonly referred to as Watusi. Also known as the Cattle of Kings, Ankole cattle and Royal Ox, this breed originated in eastern Africa, most commonly in the areas of Uganda, Kenya, Rwanda, Burundi, Lake Victoria and Tanganyika. 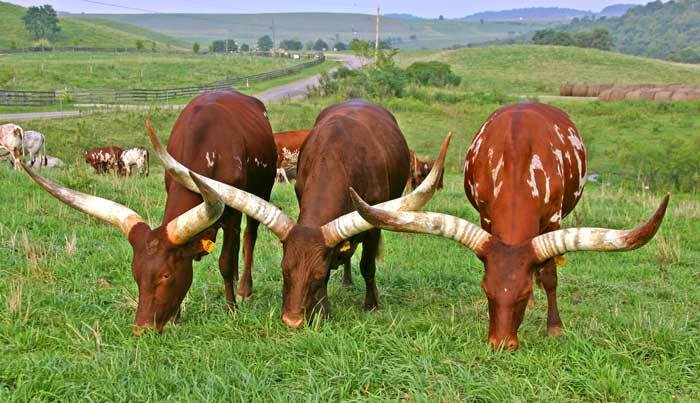 The various members of this breed are often named for the tribe that raises them or are classified by the area in which they are raised; Watusi, for the Tutsi tribes of Rwanda and Burundi; Ankole, Bahima, Bashi and Kigezi and Kivu. 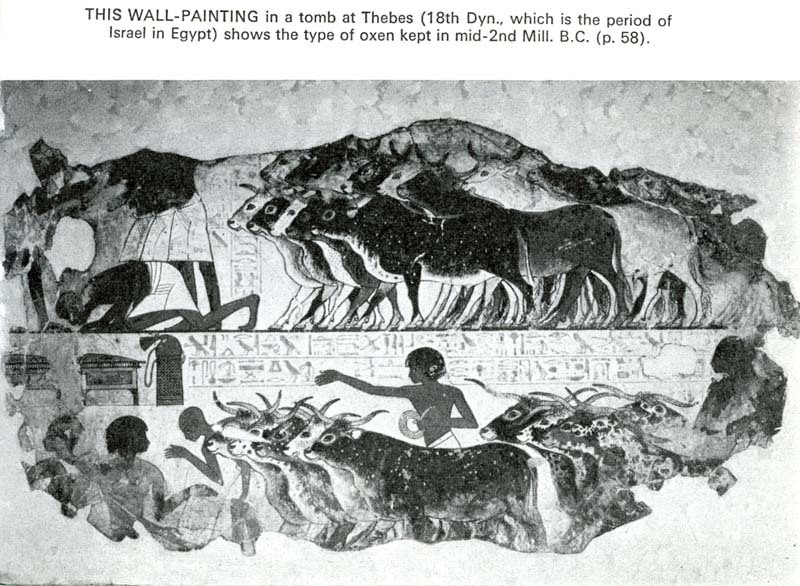 Cave drawings which have survived for thousands of years, as well as Egyptian tomb paintings. These and other artifacts suggest that the predecessors to the present day breed played an important role in the lives of the tribes. In Rwanda where the Tutsi ruled the common type of Watusi were known as Insanga (meaning "the ones which were found" because according to tradition they had been discovered by the first kings) and exceptional individuals with huge horns were known as Inyambo ("the cows with long, long horns" purportedly to have been twelve feet or more from tip to tip) and were only owned by the King and considered to be sacred. The cattle herds played an important role in tribal life. The herds provided a form of barter, trade and a sign of wealth within the tribe. The animals provide a source of food when none would otherwise have been available. Seldom slaughtered for meat, except in ceremonies such as the coming of adulthood, the cows are frequently milked and bled to make a yogurt like high protein drink. This clabbered milk drink is a staple to the diet. The animals themselves provide status for a man within the tribe, his wealth being measured by the number and quality of animals that he owns. In addition they are used as gifts to a brides family at the time of marriage a tradition known as bridewealth. Physically even present day Watusi are striking. 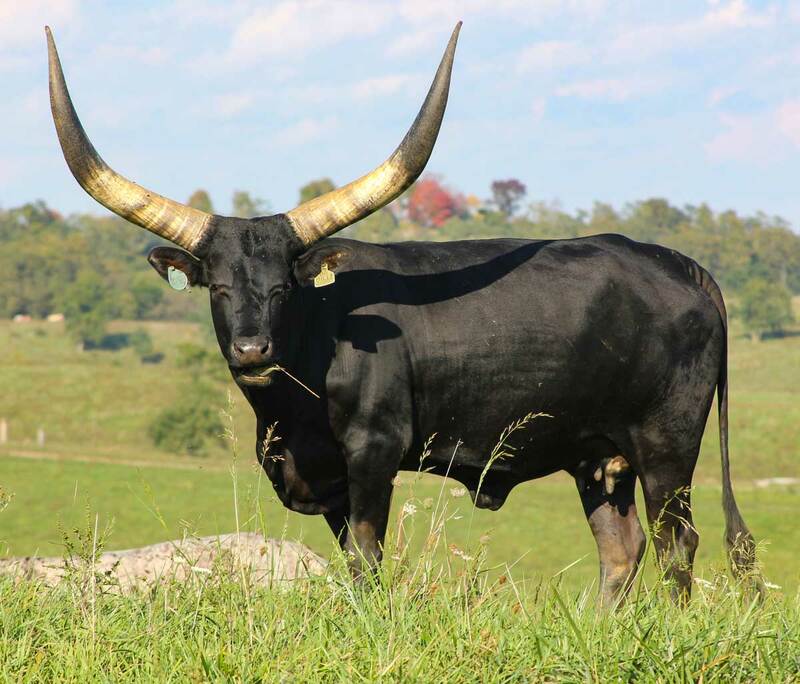 They posess the largest and most dramatic horns of any breed of cattle. Individuals in this country have been known to have horn bases that measure 28 inches in circumference, 8 inches in diameter and eight feel from tip to tip. The horns vary from lateral almost flat growth to an upswept arched shape known as lyre, sometimes with the tips almost touching. Watusi are stately and tall, relatively long legged and posses a small to negligible cervico-thorasic hump (placed up towards the base of the neck). These animals have an extremely long, rope-like tail for swatting insects. Watusi are most commonly a deep red or red with some white speckling, however, they are also known to occur in black, brown, white, yellow, dun, gray and brindled as well as some heavily spotted combination of these colors. Nature helped to develop the characteristics of Watusi in order to allow the survival of the breed. In the predator infested wilderness of eastern Africa an animal that could not protect itself and its young from predators would be doomed to quick and violent death and eventual extinction. Similarly they must remain strong under adverse conditions to still survive the attacks. For this reason nature and the herdsmen selected the large horned females that could fend off the cunning attacks of groups of jackals or lions to protect herself and her young., The young have to be born quickly and they must be strong enough to outrun the predators within a short time of birth. The mother must produce a highly nutritious milk to nourish the young for the speed and stamina necessary in the environment and must be able to produce it from whatever feed may be available. In Watusi the cows and bulls are long legged, making them capable of running and jumping with tremendous agility. The cows have a small, tight udder that would not be an easy target for predators or thorn bushes, yet they produce milk to nourish their young that tests out with very high butter fat. They give birth to a very small calf with the ease that is natural to wild species of animals. The calves are especially alert and are capable of running along with their mothers and the herd within a short time of birth. The breed is highly social, much preferring to stay in a group for company and protection. At night they tend to form a circle with adults lying on the outside, horns out to protect the calves located in the inner circle. The calves will hang in groups; by day, always in close proximity to at least one adult and when frightened will instinctively run in front of the horns of a retreating mother or under her belly for protection. Modern Watusi are a medium sized bovine with cows generally weighing from 900 to 1200 pounds and bulls weighing from 1400 to 1900 pounds. The newborn calves weigh from 40 to 60 pounds. Watusi can fill the requirements of many aspects of this industry. The first and most obvious is the uniqueness of this animal. They look exotic and are certain show stoppers as a display. With this animal you can have it all. They are striking for display as are antelopes, gazelles and other, horned hoofstock, yet handle with the ease of cattle. To cattle breeders, Watusi possess some very desirable traits of great importance to the potential buyer and many that have been lost or bred out of other modern breeds. In addition they can add some exiting differences that appeal to a broad range of needs and desires. In the harsh environment in which this breed has adapted for centuries, survival is the primary consideration. Through all of these years they have become highly tolerant to brutal extremes of condition. Watusi are especially resistant to drought, heat and direct sunlight. Their huge horns (shown at right) act as a natural cooling system by circulating blood through to the ends of the horn to disperse the heat before returning it to the body. In addition, their digestive systems have the ability to utilize poor quality and limited quantities of food and water. Their native homeland can boast days in the which temperatures can soar to 120° and nights can plummet to 20°, this in addition to low quality sparsely available feeds, seasonally limited water supplies, virulent diseases, predators and parasites that would have long ago destroyed less hardy animals. Yet through it al, Watusi have flourished. These survival abilities have allowed them as a breed to not only survive the centuries in Africa but to become established on the continents of Europe, South America, Australia and North America. Over 7000 years of survival under harsh conditions has developed numerous qualities, many of which we may not understand or even be able to evaluate. Watusi cattle first made their appearance in the United States in 1960 when 2 bulls, which were born in Scandinavia, were imported. It took another three years before the first female was brought in to keep them company. From these recent and meager beginnings an arduous breeding program was developed. To aid in the development of the breed whose numbers were so severely limited and to add hi-bred vigor to such a small genetic pool, an up-breeding program was developed. Under this program, Foundation Pure bulls (those of 100% Watusi bloodlines) were bred to females of other breeds. The female offspring of this first mating were registered as 1/2 blood and bred back to Foundation Pure bulls. The offspring of this second generation were registered as 3/4 blood. The females of this 3/4 generation were bred back to Foundation Pure bulls again to produce 7/8 %. Females of 7/8% and above are now registered as Native Pure, males must reach 15/16% prior to being designated as Native Pure. Any Native Pure female bred to a Foundation Pure bull will produce a Native Pure offspring. Native Pure bulls can be bred to percentage females and their offspring registered. Foundation Pure animals are only the result of breeding Foundation Pure to Foundation Pure. Today, thanks to the efforts of dedicated private breeders and zoos who have worked over the years to help preserve these magnificent animals, breeding stock is now available to the public.